Unlike many panelized home builders who enclose their home shells using standard XPS and EPS foam core SIPs exclusively, Bensonwood builds many of its own structural, insulated wall and roof panels to realize the visions of its in-house design team and outside architects alike, while reducing waste by eliminating cutouts for doors and windows, which are not recyclable and end up in landfills. 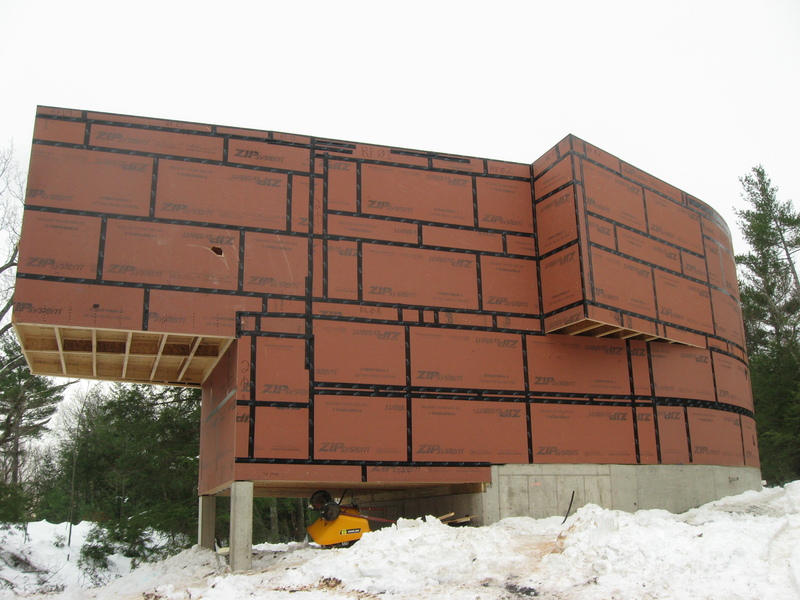 Our walls feature dense-pack cellulose for insulation (a renewable, recycled product), and can be easily upgraded to extreme R-Value and air tightness for Passive House levels of performance. They also incorporate our Open-Built® chases for easy access to wiring and plumbing. 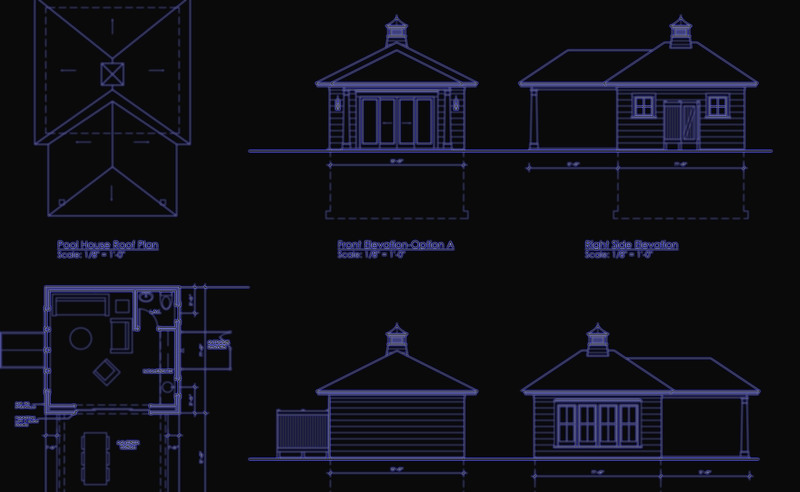 Perhaps best of all, our custom panels can accommodate curved walls and join complex, compound roof pitches to realize the contemporary designs of even the most innovative architects. One such Passive House design, by Jonathan Knowles and Laura Briggs of Briggs Knowles Architecture + Design, is a strategically sited home on a wooded lot in the Hudson River Valley of New York. Passive House is a rapidly emerging standard requiring that buildings use extremely small amounts of energy for heating and cooling. The striking 3-bedroom, 2.5-bath house re-imagines the often utilitarian designs of the Passive House vernacular with its own unique curvilinear aesthetic, open space plan and multi-level views. The first-floor plan includes a living area with a wood stove and screened porch, a separate kitchen and dining area, 2 bedrooms, 1.5 baths, a mechanical room, and a polished concrete floor. The dining area and one of the bedrooms are built into the curvature of the outer wall design, creating interesting interior spaces and angled wall partitions. The second-floor plan has a generous, curved master suite complete with a large walk-in closet, sauna, bamboo wood floor, balcony, and dramatic, cantilevered porch. Rounding out the second floor is a large playroom open on one end to the living area below. Bensonwood delivered and rapidly raised the home shell in the middle of winter, with R-49 roof panels and R-35 wall panels pre-installed with Zola triple-glazed windows. 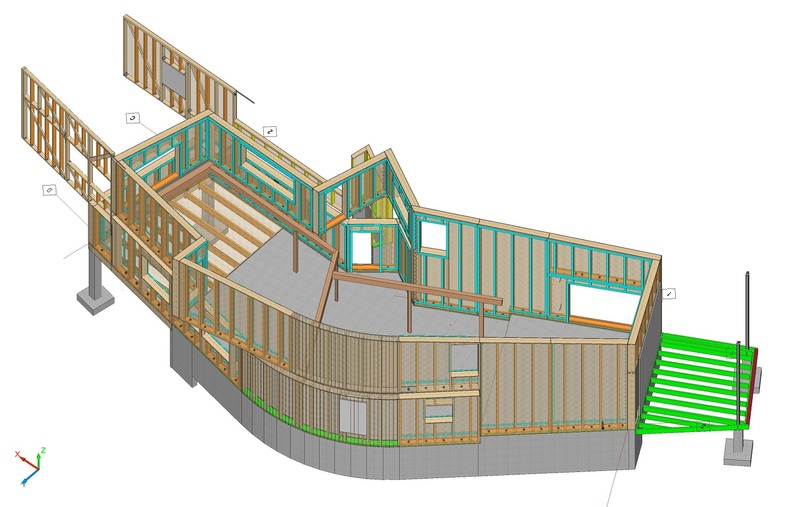 From there, the on-site builder, John Hommel of Ashley Homes, added additional layers of insulation to easily bring the house up to Passive House levels of performance. 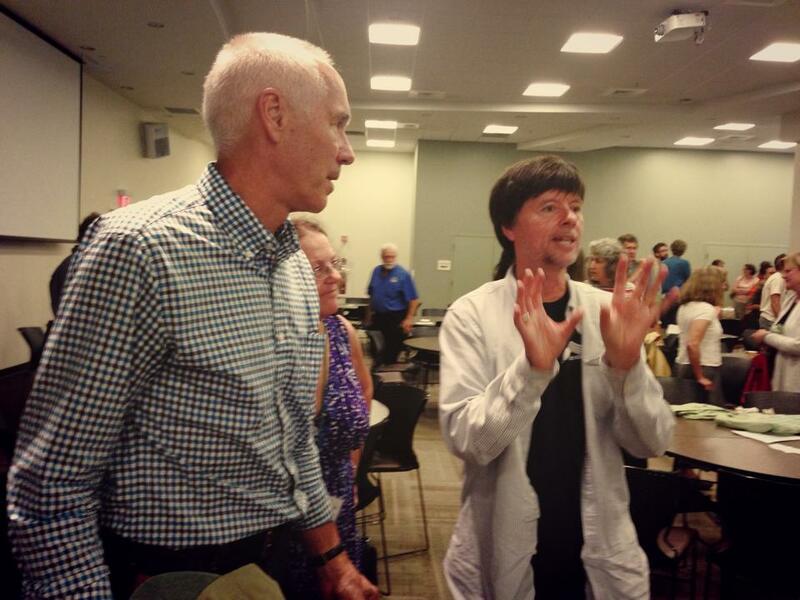 Bensonwood’s Tedd Benson (left) and filmmaker Ken Burns at the 2014 Timber Framers Guild conference. 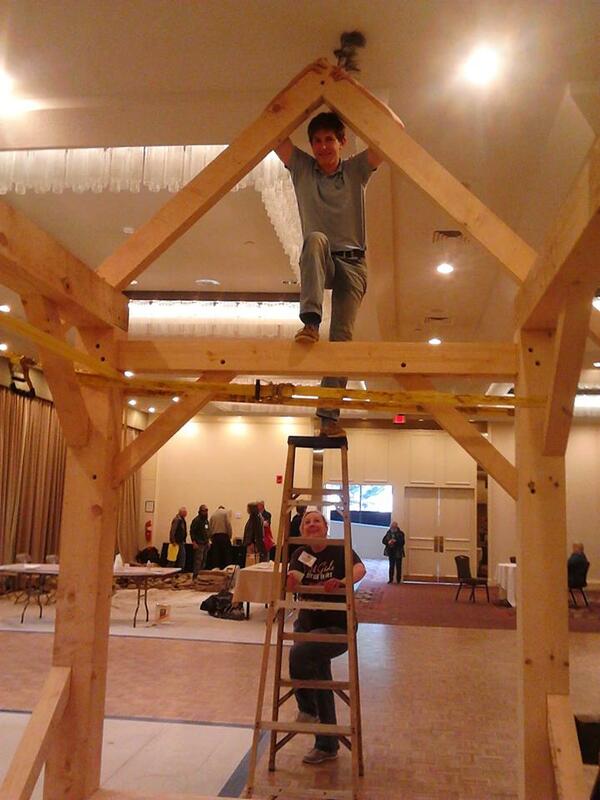 The Timber Framers Guild held its annual Conference, August 7-10, at Southern New Hampshire University in Manchester, NH, in the heart of timber framing country. In keeping with the conference’s historical track, the renowned documentary film director-producer Ken Burns, known for such acclaimed PBS documentaries as The Civil War, Baseball, Jazz, The War, The National Parks: America’s Best Idea, and Prohibition, was the featured speaker at the Conference. A scene from the short film by Ken Burns and Florentine Films’ Evan Barlow on the raising of Ken’s studio barn. Friends of Burns, Tedd and Christine Benson encouraged him to participate in the conference. A timber frame enthusiast in his own right, Burns hired Bensonwood to build his Florentine Films studio in 2012. The design and building of this timber frame barn structure is a new barn made to look old, and is the subject of a short film independently produced by one of Burns’ collaborators at Florentine Films, Evan Barlow, which was shown at the conference. In the film, Tedd talks of the importance of timber frame architecture throughout American history—with its honest and durable aesthetic—and, by implication, the essential message it holds for todays troubled building industry. Bensonwood’s visiting French Compagnon, Thomas Beauvillain, (top) helps demonstrate classic timber framing techniques. Bensonwood architect Bill Holtz also appears on camera to describe the collaborative, creative process of working with filmmaker, Ken and his wife, Julie, to build the studio. In the film, Bill describes the timber frame design, with its open space plan, as anchored in history but not limited by it; a point underscored by the interior scenes where traditional and modern elements blend seamlessly together. At one point, in tying the film studio’s design to its function, Bill compares the play of light through the building’s carefully calibrated catwalk balustrade to an early Zoetrope, the 19th century forerunner of the modern motion picture projector. Bensonwood Timber Frame Captain, Dennis Marcom (right), using a vintage mortise cutting tool at the 2014 TFG conference in August. Bensonwood, a platinum sponsor of the conference, was well represented at the event with its “Who’s Who” of timber framing. In addition to the Bensons and Mr. Holtz, long-time timber frame department head and safety director, Dennis Marcom, presented a company review slideshow and collaborated with a State Department of Labor OSHA representative regarding safety in the workplace. (Left to right. ) Bensonwood architect Bill Holtz, timber framer Dennis Marcom, former Bensonwood engineer Ben Brungraber and Tedd Benson. Also on hand, former Bensonwood employee and structural timber engineering maverick Ben Brungraber, PH.D., P.E., now of Fire Tower Engineered Timber, served on the Engineering Council Symposium preceding the conference. Ben worked at Bensonwood from 1986-2007, and was instrumental in elevating our engineered timber frames to new levels, proving to building inspectors unfamiliar at the time with modern timber frame engineering the efficacy of his sophisticated compression and tension joinery. In 1984 Tedd, along with a small group of timber framers, formed the Timber Framers Guild of North America to establish a forum for learning and standards. Christine is currently on the TFG’s board of directors. Are you one of those people who owns a classic car and longs for an appropriate place to keep your dream machine? That was the impetus behind one car enthusiast’s desire to physically connect his passion for collectible automobiles to his existing 1930s Delaware residence. The owner, who has an existing garage for his family cars, tools around in a ‘76 Triumph TR6 and hopes to acquire more vintage cars once his new timber frame car barn is completed next month. The result will be an architecturally true barn and connector addition that can drive home, literally, his automotive passion. The barn and connector were designed by Patrick McDonough, of John Milner Architects, to integrate and reflect the style of the existing main house while adding to the majesty and proportion of the façade. 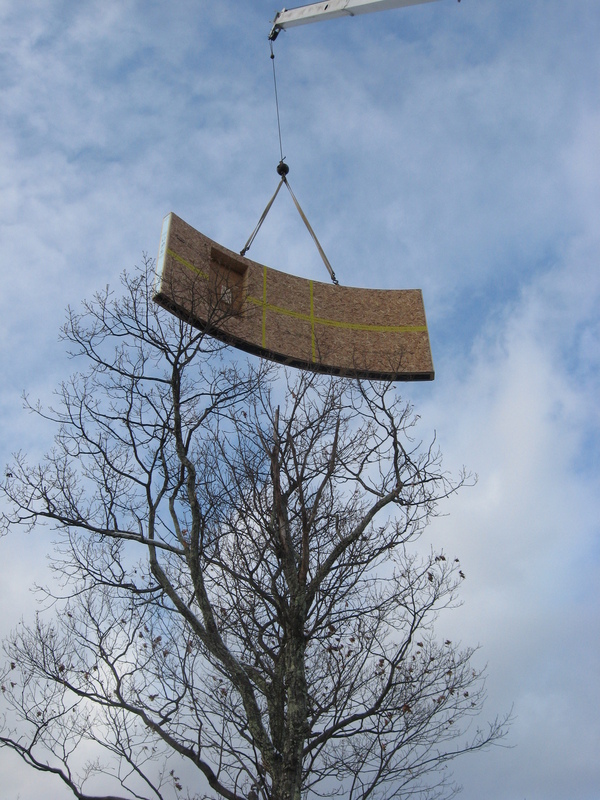 Bensonwood was hired by the owner/builder, a repeat client, to fabricate and raise the free-standing timber frame barn shell. 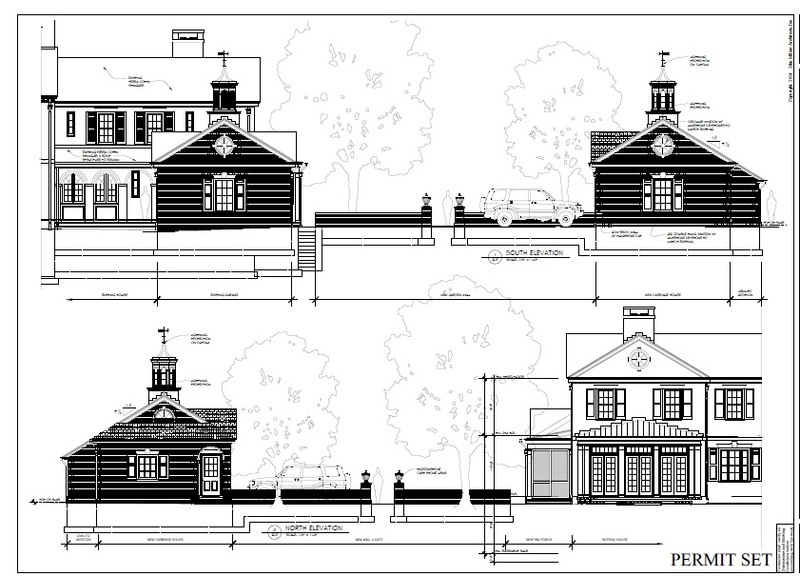 The lengthy connector joining the house with the barn will be site-built by Dewson Construction Company, a Delaware-based general contractor and construction management firm. The car barn, with four bays and an epoxy-painted concrete floor to showcase the vehicles, will be a traditional design, with a single, 28-foot-long glulam girder to achieve a post-free opening to the shed bump at the rear of the building. 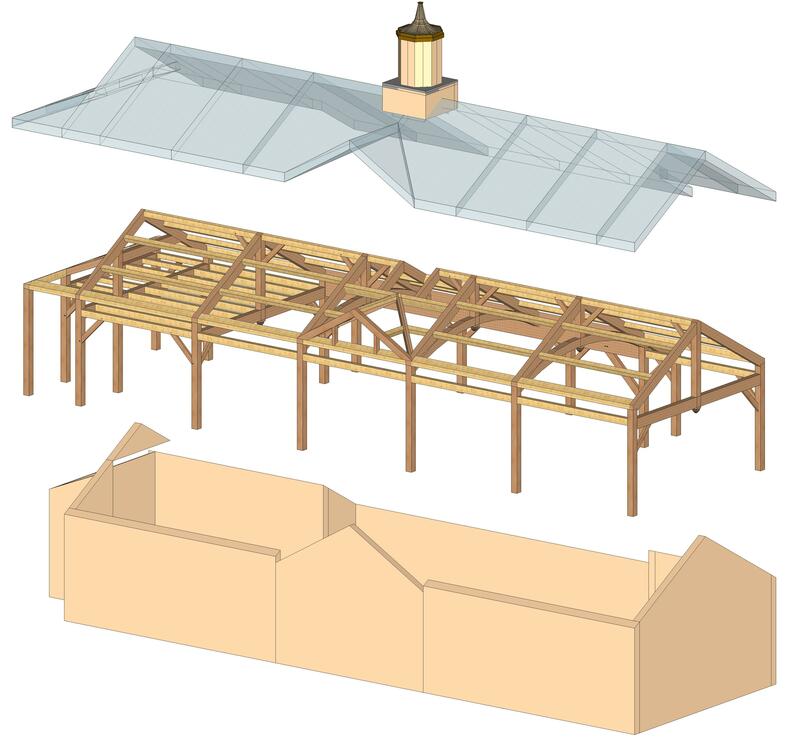 Roof trusses on either end of the barn will have straight bottom chords, with three arched glulam bottom chords on the trusses in between, defining the vaulted space. The structure includes a central king post with decorative and structural steel reinforcement plate custom fabricated by Bob Taylor of Alstead, NH. A multi-purpose loft with ladder at one end of the structure will add useful square footage to the plan. 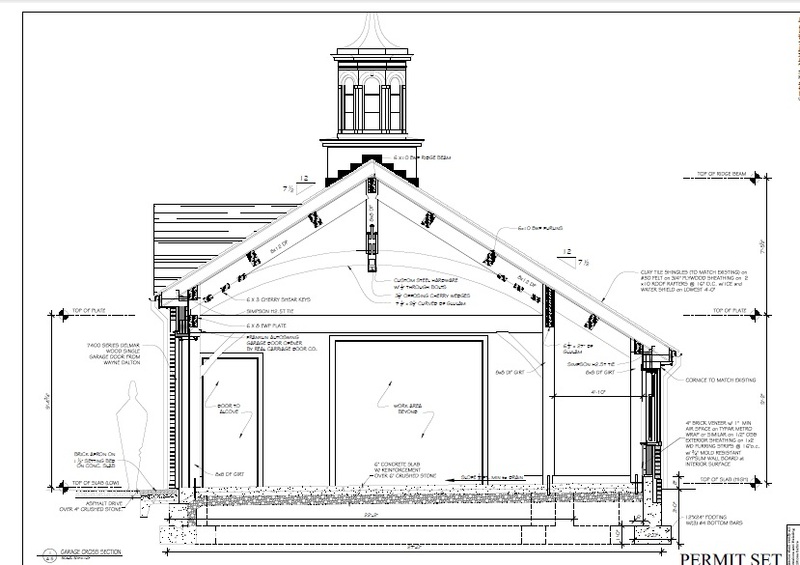 To integrate the architectural style of the barn with the main house, an eight-sided “lantern” cupola will be stick-built atop the barn by a local company to match the cupola on the main house. In addition to its unifying aesthetic, the copula will allow in natural light to illuminate the timber frame interior and future car collection. 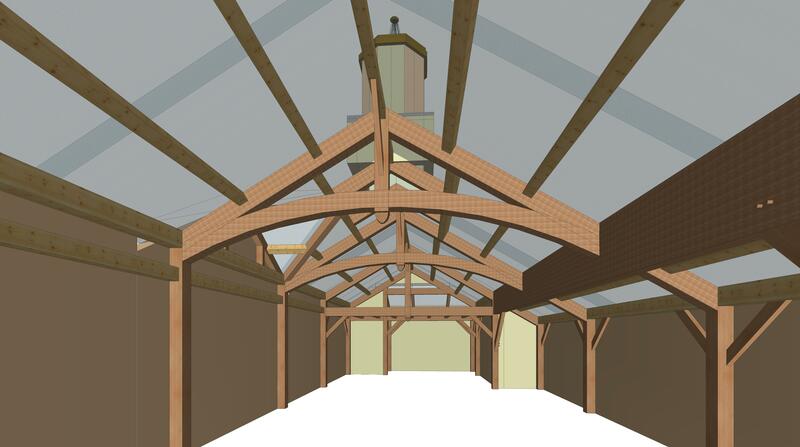 Dewson Construction will then finish the barn with a brick exterior to match the main house. The classic car barn, currently in fabrication at our Blackjack Crossing facilities in Walpole, NH, is slotted for a September 15 raising, with the complete weather-tight shell installed within a week’s time. 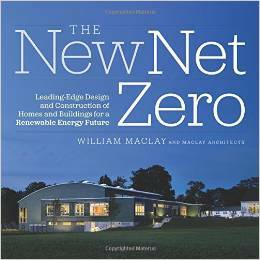 Bensonwood is featured prominently in a new book on Net Zero building by renowned architect William Maclay. 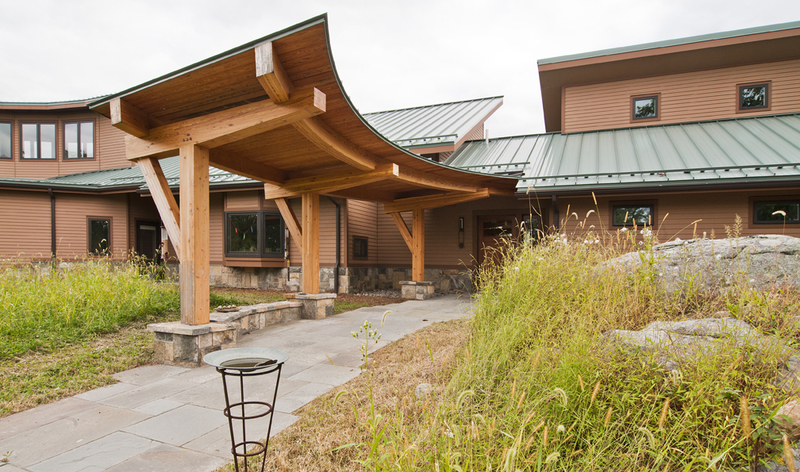 We collaborated with Maclay Architects as a member of the team which designed and built the award-winning net-zero Bosarge Family Education Center at the Coastal Maine Botanical Gardens. 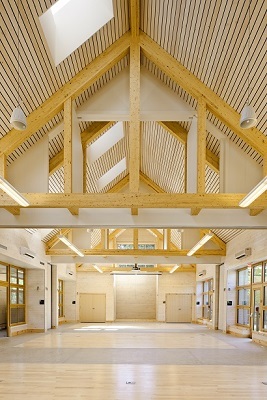 The LEED Platinum-certified center was Maine’s first net-zero institutional building. The new threshold for green building is not just low energy, it is net-zero energy, and in The New Net Zero, sustainable architect William Maclay charts the path for designers and builders interested in exploring green design’s new frontier—net-zero energy structures generating as much energy as they use while remaining carbon neutral. Since traditional American buildings account for roughly 40 percent of our total fossil energy use, the significance of net-zero building is growing increasingly important—among designers interested in addressing climate change as well as homeowners concerned about energy efficiency and long-term savings. Maclay, an award-winning net-zero designer whose buildings have achieved high-performance goals at affordable costs, makes the case for a net-zero future; explains net-zero building metrics, integrated design practices, and renewable energy options; and shares his lessons learned on net-zero teambuilding with like-minded companies such as Bensonwood. The comprehensive overview is accompanied by several case studies, which include institutional buildings such as the Bosarge Family Education Center, commercial projects, and residences. Both new-building and renovation projects are covered in detail. 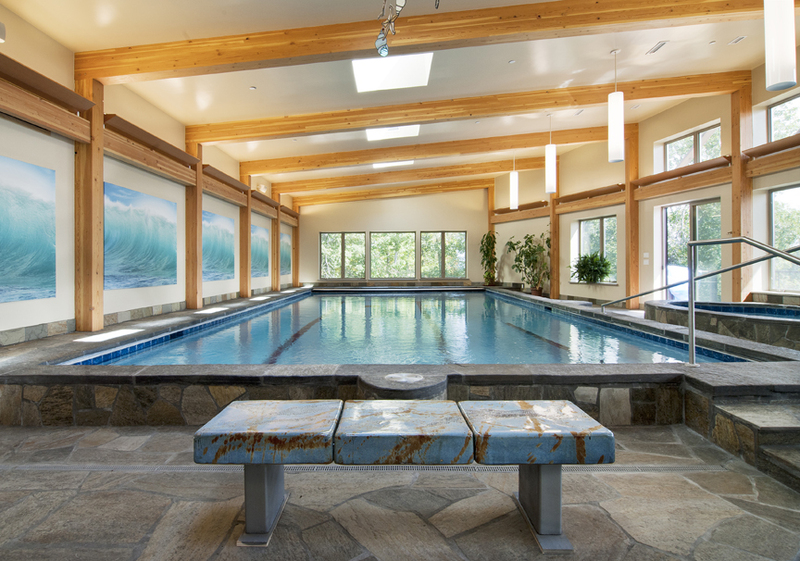 Unity Homes is profiled in the book, as is our multi-layered Open-Built® system. The New Net Zero is geared toward professionals studying net-zero design, but is also suitable for laypersons seeking inspiration and strategies for beautiful and renewably powered net-zero options. 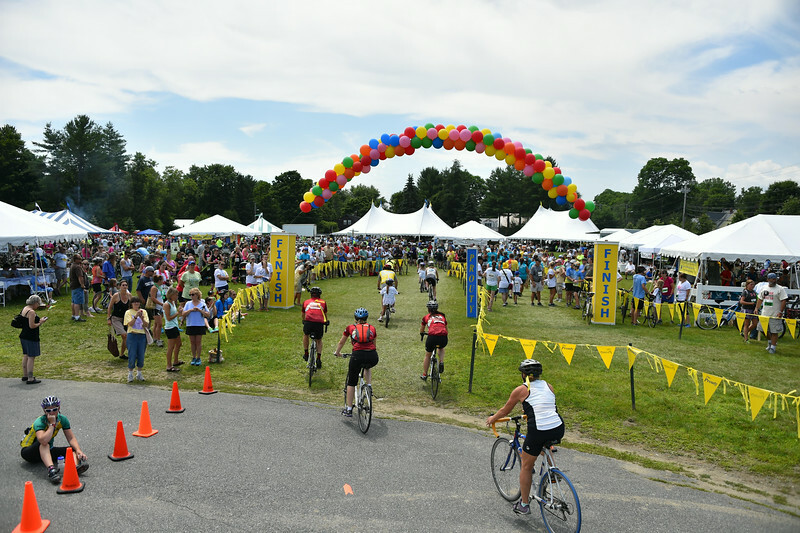 In our 11th year riding the Prouty, our 52 team members raised $11,000 for the Norris Cotton Cancer Center at Dartmouth-Hitchcock. Our team members ranged in age from 5 to 65+! 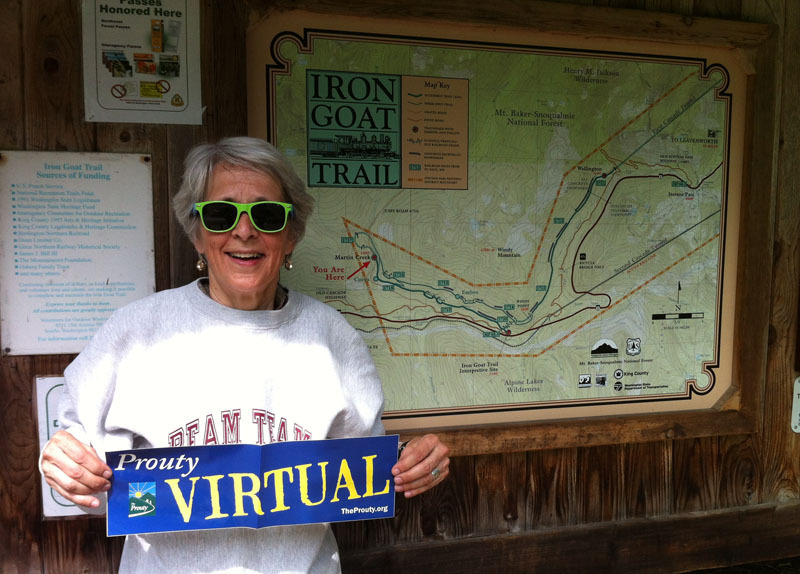 The 33rd Annual Prouty raised over $2.7 million from cyclists, walkers, rowers, golfers and “virtual” participants, like our West Coast sales rep., Marilyn Taggart, in Seattle. Marilyn (below) rode the Iron Goat (aka Mosquito!) Trail, an old railroad bed in the Mt. Baker-Snoqualmie Forest in Washington State.